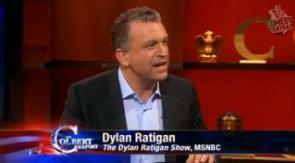 Colbert To Dylan Ratigan: “It Occurred To You In 2008 That People Were Watching” CNBC? MSNBC host Dylan Ratigan was a guest on The Colbert Report – a show where the character Stephen Colbert plays despises MSNBC but probably agrees with a lot of Ratigan’s more libertarian points of view. But the most interesting exchange came as Colbert pressed Ratigan on his previous hosting gig – at CNBC’s Fast Money, particularly before the 2008 collapse.